The obtuse origin of the book you hold is long ago and far away and very likely outside your comfort zone, rooted in architectural history, my academic bailiwick. During the summer of 2006 I had an idle but intriguing thought about 19th century American architect Louis Sullivan. If not the outright inventor of the skyscraper, Sullivan was at minimum the designer who gave poetic expressive form to its lofty potential: he made the multi-story office building a proud and soaring thing. But if pre-1900 Sullivan made the tall building seem taller, post-1900 Sullivan, addled with alcohol and possibly worse addictions, directed his creative vision perforce to a more modest architectural type: the home-grown bank in small Midwestern towns. Eight of these — his self-styled “jewel boxes”— emerged during nearly as many years, between 1908 and 1919. Lush with Sullivan’s organic ornament — America’s other claimant, along with the glass of Louis Comfort Tiffany, to the Art Nouveau — it was also late evidence of Emersonian transcendence and the American character shaped between our Civil War and the Great One. While that handful of towns were building Sullivan banks, from Ohio in the East to Iowa and Minnesota in the West, they and hundreds of other communities benefited from the largesse of industrialist Andrew Carnegie. A self-educated immigrant Scot, Carnegie extended that opportunity for self-improvement to the employees of his steel mills — the “retail” period of his benefaction — then to the country at large and eventually to the English-speaking world; a program that underwrote 1800 public libraries in the U.S., Canada, and Great Britain. The coincidence of these two seemingly unrelated phenomena — a few Sullivan banks and hundreds of Carnegie libraries — raised a curious question on a quiet August night in 2006, nearly a century after the fact: Sullivan was working for a clientele who may well have pursued a Carnegie grant. Bank presidents were the very sort likely to serve on library boards and other positions of clout and credibility. Simply put, he was in the right place at the proper time to have received a Carnegie-funded or other library commission. But he didn’t. As a hybrid designer-historian, wondering why something hadn’t happened was far less engaging than imagining what could have been. Agincourt, Iowa has been the extrapolation of that wonder. To begin, I needed what every architect does: a client, a programme, and a site; aside from Carnegie’s cash, these three were my responsibility. And while I can’t be Louis Sullivan, I can imagine someone under his spell. There are more than a few known to architectural history who might serve as models. A site in early 20th-century Iowa was a good choice: Sullivan had designed five buildings there during 1910-1914 — three banks, a department store, and a church. His name might even have been recognized, if not an outright household word. But rather than choose an existing Iowa town, each with its own historical baggage, I chose instead to create a typical mid-19th century railroad town — the iconic stuff of “Music Man”, Our Town, and “It’s a Wonderful Life”. Every Midwest hamlet was eager, even destined in its own collective mind, to be the New Chicago and take a rightful place in the heady economy of post-Civil War America. Agincourt — a name I chose because I knew we’d mispronounce it — as the seat of Fennimore County, elbowed its way among Iowa’s ninety-nine others, where the reserve of the native Sac and Fox people in the northwestern part of the state had been opened to settlement. In hindsight it seemed only proper that my urban and architectural enterprise should be founded on America’s original sin, the usurpation of Native land. Planning the town had been done for me by the country’s 19th century railroads: mile-square grids plunked at six- to eight-mile intervals and left to fight for economic hegemony. Then finding the town’s 100% corner, the benchmark site at its core, for the new library — the gem in Agincourt’s civic crown, along with a courthouse, academy, and spiritual necklace of churches — was far easier than creating Anson Tennant, the would-be architect, my avatar for the library commission. Every building, even the humblest cottage or garden shed, tells a story. The Paris Opera required Haussmann and Garnier; the Parthenon, it’s Pericles, Iktinos and Kalikrates. So the Agincourt Public Library would be their counterpart. The cultural heart of a modest but eager Midwest community anxious to write its own chapter of the American story. The project that grew from an innocuous summer speculation got seriously out of hand, however, engaging the creative energies of students, fellow faculty, colleagues, and friends, some new, some old, which generated two museum exhibits, multiple commissioned artworks, and the world premiers of two musical compositions. Most important, buildings materialized in tandem with their narratives; place-making and story-telling do go hand in glove. Eventually I and this story found a path to the first Historical Fictions Research Network Conference in 2016; to the nurture and moral support of Dr Farah Mendlesohn, its founder; to many new friends of this project — like Dr Kate Macdonald and this publishing venture; and to an audience far beyond the project’s modest origin eleven years ago — a prospect I could not have anticipated. Our chronicler in the following pages is Howard Tabor, mild-mannered reporter for a struggling newspaper, The Daily Plantagenet, where he writes a local history column lost in the Saturday editions: “A few figs from thistles…” Many of Agincourt’s more colorful denizens are recorded there, as are the word-pictures of their world, which we hoped would be more real than real. Ideally you will come away from these tales wondering if you hadn’t stopped once for pie and coffee that summer you drove cross country to visit great-aunt Phyllis. Well, the Bon-Ton Café is still there. And the rhubarb pie is just as you remember it: not too sweet and plenty of lard in the crust. So, as the opening credits of “The Lone Ranger” intoned each Saturday morning of my misappropriated youth, “Come with us now to those thrilling days of yesteryear.” Welcome to Agincourt, Iowa, the town that time forgot and geography misplaced. 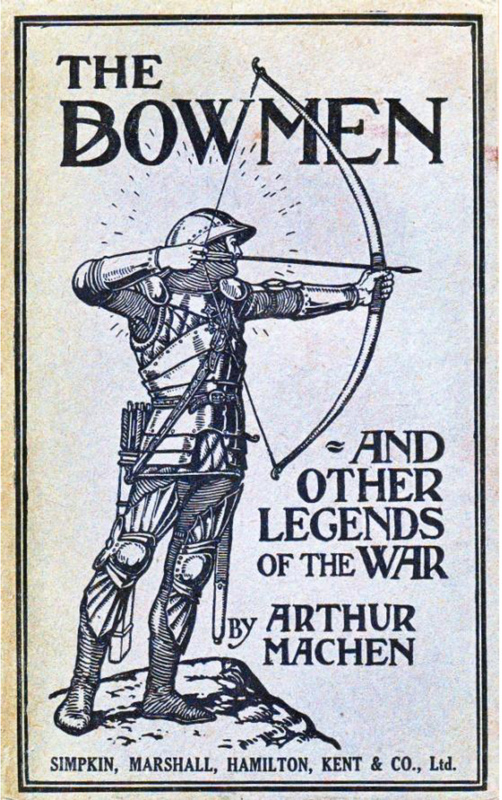 Welsh author-journalist Arthur Machen had already written several articles about the British in the First World War when, on September 29th, 1914, a short story of his appeared in a London newspaper. A fictional treatment of the Battle of Mons, Machen wrote a story so convincing that it was taken for truth. British forces in retreat sought heaven’s intervention. Calling out to St George, their prayers were answered with the appearance of Medieval archers, the Angels of Mons, the very forces who triumphed at the Battle of Agincourt four hundred and ninety-eight years before. Before it could be confirmed as fiction, the story assumed legendary proportion in the pages of several newspapers and magazines. Agincourt, Iowa’s link with the events of 1415 intensified when the U.S. finally entered the conflict in 1917. The image of a Medieval bowman on Machen’s book became the model for the weather vane atop the Fennimore county courthouse. I hope we’ll be able to replicate that weather vane for the October exhibit — an important artifact in its own right (a survivor of the 1966 lightening strike that burned the courthouse itself) and a potent reminder of Agincourt’s unusual connection with the Middle Ages. Some of my friends know that, for a few years in the 1960s and ’70s, I was a Roman Catholic convert. It happened when I was a freshman at the University of Oklahoma. Many of the guys in my first-floor wing of Kingfisher House were Catholic and so I fell to attending Mass with them on Sundays (or more often the “hangover” Mass on Saturday evening, not because you were drunk then but because you were likely to be the next morning). I suppose I became conspicuous when everyone in my pew had to crawl over me to get communion; I was, after all, not a communicant. One day I stopped at the Newman Center to see Father Swett — the young, happening sort of priest who got themselves assigned to college parishes because undergraduates could identify with them. There was an issue in my then young freshman life that needed attention — I wasn’t all that enthusiastic about life — and I hoped Fr Chuck could help. After our discussion (which did help, by the way), he mentioned that he hadn’t seen me at communion lately. I replied sheepishly that I didn’t happen to be a Catholic. “Would you like to do anything about that?” he inquired. Since we were in the throes of Vatican II and communion was one step short of Vanilla Wafers and Diet Coke, I said sure and we launched into a week of catechism: Would I buy into this or that bit of dogma; that sort of thing. Finally, on a Friday night at the Howard Johnson’s all-you-can-eat fish special — it was Lent — with the waitress stopping by periodically with the breezy inquiry “More filets?”, came the moment of my First Confession: I was challenged by Fr Swett to do something nice for the person I disliked the most, which required the most anguished examination of my soul ever encountered, then or yet. First there was the inventory of people I disliked and then a parallel list of things I could do for them that fit these criteria: 1) suitably nice to satisfy God, and 2) not so nice that the recipient would notice. I would burden you with names; the process is what’s important. I think of that weekend in the spring of 1964 today due to “the incident” with little Claire Tennant’s dollhouse. As part of the backstory for Anson Tennant’s choice of architecture as a career, I created several earlier encounters with architecture and building. The first was in 1905, when Anson was fifteen or sixteen. His little sister Claire had contracted diphtheria and was not expected to survive. So he decided to make that Christmas more special than it might have been: inspired by a design he’d seen in a stack of magazines in the attic, Anson crafted a dollhouse for Claire like none other; one that was not open at the back, as you might expect, but which could open to play by means of an ingenious hinged room. [Crafted by Matt Saatkamp and two other students whose names I can’t recall.] You’ll be pleased to learn that she not only loved the gift lovingly crafted for her, but that she survived, eventually married, and lived a long and happy life — treasuring her brother’s thoughtful gift and passing it along to other generations. The House was a feature of the 2007 exhibit. 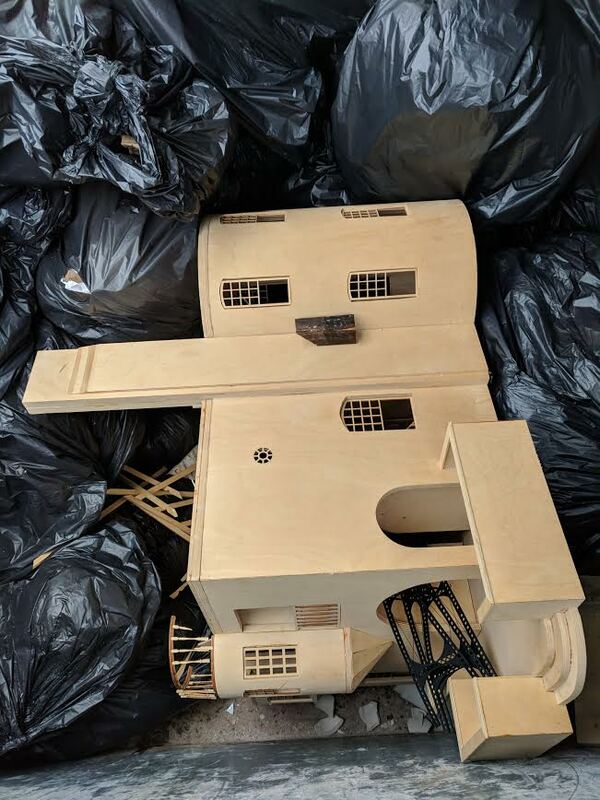 So Claire Tennant’s dollhouse survived intact, until last Wednesday night, when it got lugged to the dumpster behind Renaissance Hall, and, sans roof, was ignominiously dropped among bloated black bags of trash. A shipping palette was tossed on top for good measure, and it remained that way until Thursday morning. Ben, the I.T. Specialist, approached me in the computer lab late Thursday morning, hang-dog, and inquired if I had intended to dispose of the dollhouse, whereupon my heart sank. We hurried downstairs, assessed the situation and went into retrieval mode, holding anger off for the moment. With the house safely out of immediate harm’s way, I proceeded to the office, intent on speaking with the acting chair, who, strategically, was on a conference call. Waiting, I advised the secretary that this teaching gig didn’t seem to be going all that well, that it might be time to cut ties with the place and move on to my twilight years — though I said it far less lightly. Out in the corridor, Ben counseled restraint and called the program director for reinforcement. It’s a good thing Milton was stopping by for lunch: 1) it got me out of the place; 2) it got the damaged artifact off the premises and into his garage; 3) it got a beer into me; and 4) it gave me time to reflect. Friday morning and afternoon I tried to get back into old routines — adding to the Akron Plan database — and later that day both Ben and Cindy and I discussed what might have occurred that Wednesday night. Was it accident or intent? I preferred not to know but agreed that some sort of investigation was advised. [The rear parking lot is covered by surveillance cameras.] Whether I’ll elect to know the result is an open question. If this was a genuine accident (whatever the hell that may be), its discovery was equally accidental, and the two cancel one another out. If, on the other hand, this was malicious and there are folks in the department displeased enough with me to have done this, I prefer to not have that possibility confirmed. Suffice to say, my demeanor has taken a turn for the sour and I’m unlikely to relate to my place of employment for the past forty-six years in quite the same way. After all is said and done, I may some time soon be required to do something nice for the person….oh, well, never mind. The Minnesota lake district east of Moorhead-Fargo is so populated during the summer months with people from Fargo-Moorhead that, frankly, I can’t see the point. Highway 10 is sclerotic on a Friday afternoon; the beaches are crowded, so are the restaurants, and driving back to town is a face-to-face encounter with death. If you have your own “lake place”, it’s practically guaranteed that you’ll own two of everything, one set in town, the other at the lake. I have enough to handle with just one home and that one is falling apart. 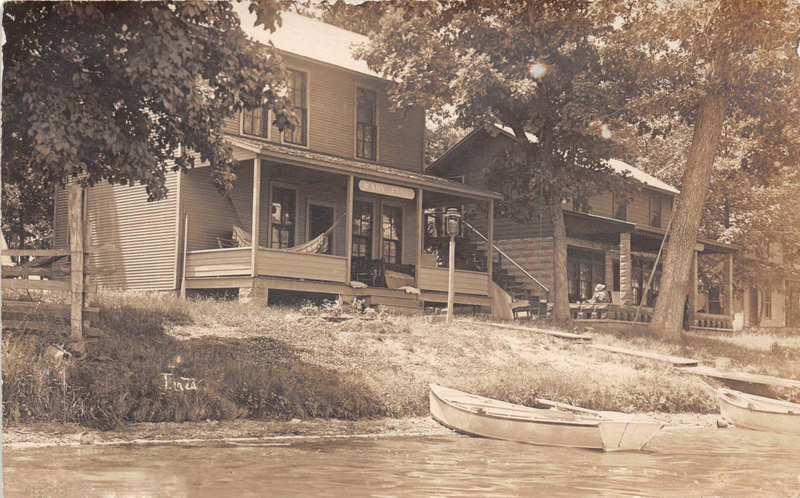 One summer about forty years ago, Jim and Sharon verDoorn rented a cabin on Maple Lake — one of dozens bearing that name across the Land o’ Lakes — which they used on weekends, the VD’s were very generous in making their rental available to me during the week. And the experience was almost completely reversed: I drove alone and unimpeded on Highway 10 as the hoards formed a forty-mile traffic jam on their way back. The lake itself was abandoned and the cabin primitive; no running water, only a radio, bare light bulbs, no telephone and that was a time long before cell phones. I was alone and ecstatic. It is those memories that flood my thinking about Agincourt’s counterpart, Lake Sturm und Drang. One of the optional paper-projects in my architectural history class is an exercise in minimalism: write the obituary for an architect/designer (regardless whether they happen to have passed on). Obits are notorious, in my research experience, for their tendency to remember the best and forget all the rest—not usually what I’m seeking. Imagine my surprise a couple years ago when the subject of the piece was me. Frankly, it was so good that I asked to student’s permission to save it for my own use, when the time comes. We should all leave an impression like this. Oh, and please take his advice: in lieu of flowers, go buy a book. Flowers fade; knowledge spurs you on to better and higher accomplishments. Agincourt may be unique among communities her size: she has both a “Y” and a Why. An outgrowth of Asbury Methodist Episcopal church—almost literally attached to its north side—the YMCA has been a community feature since about 1910. It had been a part of Asbury’s “Social Gospel” ministry since the ’90s and became a semi-independent operation just before WWI. But the other part of this Y–Why pairing is an odd structure behind Hradek’s Shoe Repair on South Broad street. 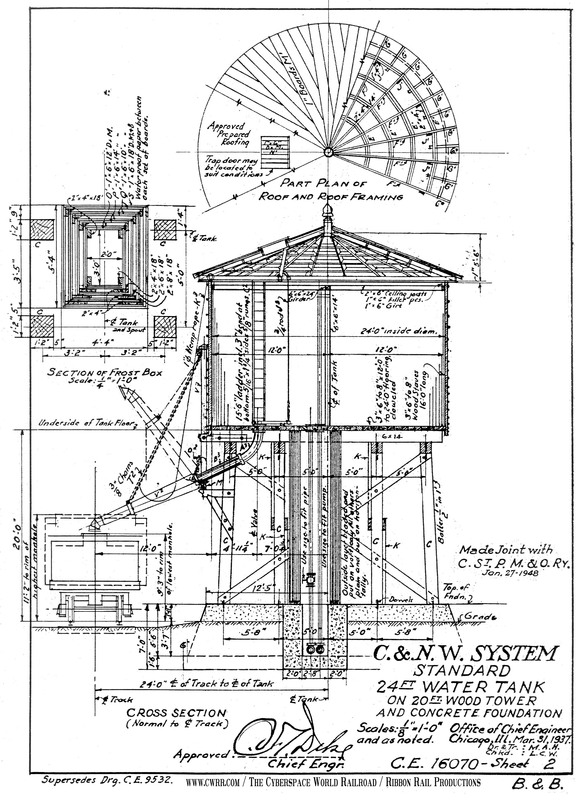 Through a glitch in railroad paperwork, the Milwaukee Road depot received two prefabricated water towers to replace an earlier tower long past useful life. Rather than admit clerical error, the duplicate kit was offered for sale at a bargain price—finagled by Frank Steele, station manager. In addition to his railway-related job, Steel was also an organizer of Agincourt’s “Bradlaugh Club”, a group of certified, card-carrying non-believers who met regularly as an alternative to organized religion. The group had met in members’ homes but wanted a physical presence in the city parallel with the churches in their midst. So, Steele arranged the sale to his fellow co-irreligionists and bought the back fifty feet of Hradek’s lot for site. 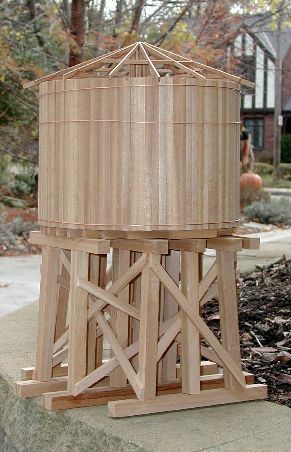 Imagine the fun of repurposing something so non-spiritual as a water tower as the center of non-belief in Agincourt. That’s what I’m trying to do just now, to build a model for the October 2018 exhibit. The program will be simple: a rotunda reached by stairs beneath; the space itself, a combination library-lecture room. No need for a toilet? Atheists can hold it. The library was curated by Ernie “Red” Anhauser, otherwise watchmaker at Salmagundi. Post Script: The challenge—not even a trick—is using the tower’s kit of parts. These things arrived pre-cut and pre-packaged on a flatbed rail car. One CMStP&P tower was like every other, so it arrived with exactly the proper parts and a few sheets of instruction: “tab A in slot B,” that sort of thing. Wouldn’t it be wonderful to have a model for the October exhibit? 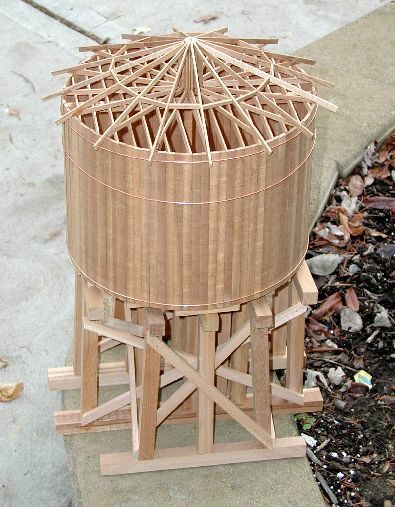 Notice the logarithmic placement of the reinforcing bands around the tank itself. 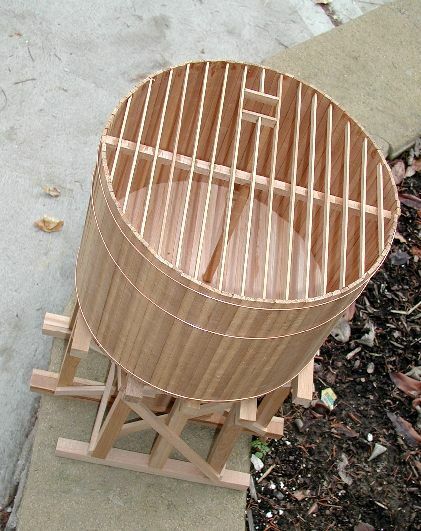 The decrease in spacing from top to bottom, corresponding to the increasing pressure of water.